Accessory vendor Logitech on Wednesday announced two additions to the company’s line of Mac-focused input devices, the $100 Bluetooth Easy-Switch Keyboard for Mac, iPad and iPhone and the $70 Rechargeable Trackpad for Mac. Like Logitech’s Wireless Solar Keyboard K760 ( ), the Bluetooth Easy-Switch Keyboard (shown above) can pair with up to three devices simultaneously—for example, a Mac, an iPad, and an iPhone—and lets you switch between those devices with the press of a button. It offers a Mac-standard key set and layout, including Mac- and iOS-compatible special-function F-keys. The keyboard uses the same low-profile key design as Logitech’s other recent Mac keyboards. 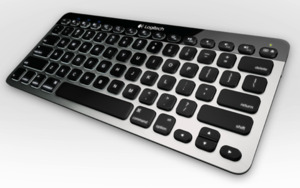 Unlike the K760, the Easy-Switch Keyboard offers backlit keys to make it easier to find the right key in dim or dark rooms; Logitech says a sensor on the keyboard automatically enables this backlighting whenever your hands are near the keyboard and automatically adjusts the backlight brightness based on the ambient light level. Instead of being solar powered, the Easy-Switch runs off a rechargeable battery that charges via a USB cable. Unlike Apple’s trackpad, the Rechargeable Trackpad has a built-in rechargeable battery that charges using a USB cable. Logitech says the Rechargeable Trackpad can be used for one month from a full charge, and a convenient On/Off switch lets you conserve battery power when you’re not using the trackpad. Each accessory can be used while charging, so you don’t have to interrupt your work if the battery runs out. Logitech says both accessories will be available in January 2013.